Tidewater Blacksmiths Guild via Vince Nakovics. Mr. William Zeno called me this past Friday, Jan 4th, 2008 after seeing our article in the Beacon. 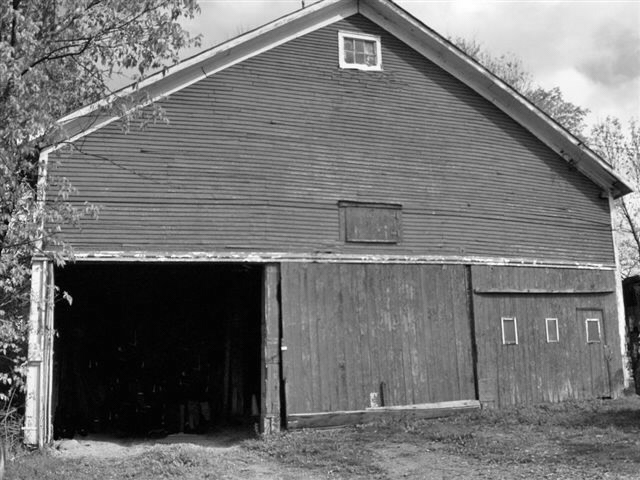 Mr. Zeno wanted to know if we were interested in some tools that his Grandfather Edson Wisell had used in his Shoreham, Vermont blacksmith shop in the late 1800’s, at least 1898 or before. I agreed to meet him at his home on Saturday Jan 6th. 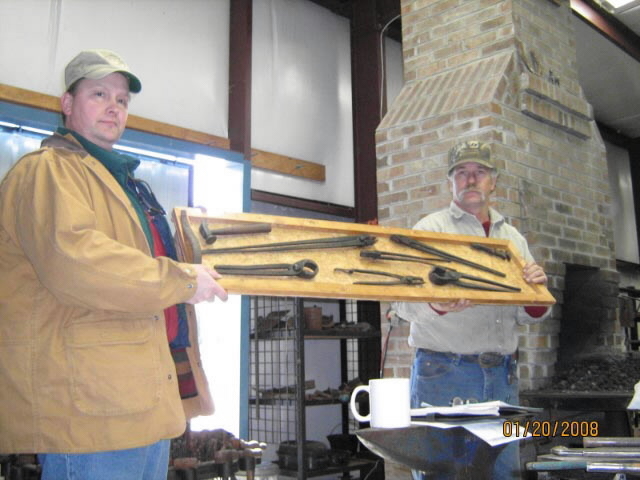 Mr. Zeno presented me with a board holding 2 styles of nippers, 3 tongs, 1 chain tong, 1 cobbler hammer, 1 wrench and 1 lid handle. While tools have no maker’s mark on them, they do appear to be in good condition. Mr. Zeno had them on display in his workshop up until his generous donation to the Tidewater Blacksmith’s Guild. Mr. Zeno’s grandfather Edson Wisel was born in Shoreham Oct. 13 1856 and died in Middlebury, VT in 1924. He married Sarah Shackett of Shoreham on Jan. 20, 1878. They had eight children, all born in Shoreham. I contacted Sue MacIntire of the Shoreham Historical Society and she was able to add that Edson opened his blacksmith shop in 1877 and ran it till 1906 when his son Wilbur Edson Wisell, who had been working with his Dad, took it over. At that time Edson & Sarah retired and moved 12 miles away to the county seat in Middlebury (most urban area in Addison County). Shoreham was a very active town and had about 14 Blacksmiths working in the area from the late 1700’s to well after the Civil War. I extend my sincere thanks to Sue MacIntire for her rapid dispatch of this information to me for this article. Sue was also able to send a photograph of the original Blacksmith shop, still standing on the town green. The town, fortunately or unfortunately, depending on your view point, uses it for storage at this time. Sue also provided the ad pictured below. On behalf of the Tidewater Blacksmith’s Guild Thank You! 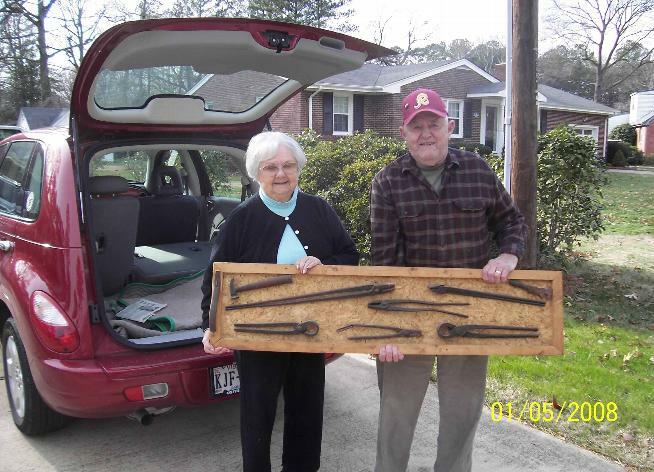 Mr. & Mrs. Zeno for your donation of these hand forged tools by your Grandfather: Edson Wisell. Above:an ad for Edson Wisell’s Blacksmith Shop posted in the Addison County Gazetteer & Directory, 1881 - 1882. Edson Wisell’s Blacksmith Shop, pictured above. Vince Nakovics turns the Tool Board over to Tim Edney, President of TBG on behalf of Mr. & Mrs. William Zeno. TBG was requested to look at a fire place located in the Ferry Plantation House at the request of Belinda Nash. Upon arrival Tom Herendeen and I surveyed the site about making a fireplace crane for a recently restored brick fireplace. Right away Belinda welcomed us and was very enthusiastic about our visit. Tom and I did some measuring of the fireplace and brainstormed about how best to fit a hearth crane. The bricklayer used pentacles with a 5/8 post instead of a hole type pentacle. They are located high in the fireplace so we will have to costom make the crane in order to fit. We showed Belinda the Sorber Collection Book of Colonial Hardware and she looked at it as a catalog of neat stuff she wants to get. 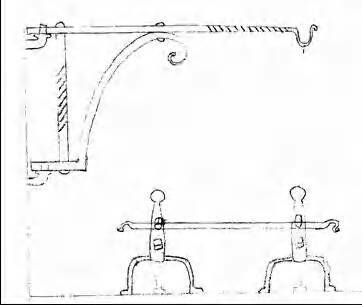 We agreed we would start off by making the fireplace crane and a trammel. She also would like a set of colonial style andirons and a trivet. 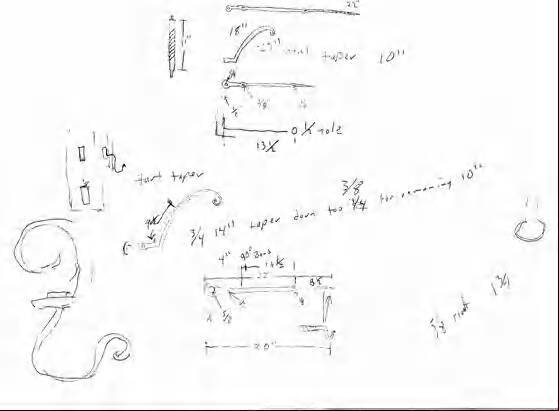 I started to work on the fireplace crane once Tom gave me all the correct measurements. First I made a sketch based on the fireplace crane at John Campbell Folk School. After the sketch I calculated what size material and how much I would need. Once the design was completed I drew a template on the metal table located in the tool room. This will allow me to check my progress and make sure I'm sticking with the design. I then needed to make some practice peices to figure out how to forge the crane and in what order. I started with a 90 deree bend. Then pre drilled a pilot hole to make sure I was centered then drifted a 5/8 hole closest to the bend. I drilled and drifted the second hole to 5/8 and cut off the excess. In order to punch the holes with the 90 degree bend you had to start the punch on the side of the anvil. This takes two people to do and remember to hold the long part up so that you can drive the biscuit thru the pritchel hole. After everything was punched and drifted I cut and rounded the end. The next step wasto taper the support arm and put a small snub end scroll with an inside curl. Measuring where to punch the hole in the supporting arm was next, this was accomplished by using a string to measure along the center. After punching the hole I heated up the support arm and bent it to fit on the layout table. I was able to complete the punching of the last hole on the top bar. Thanks to Jim Cox and Tim peaks for helping. the crane assemblies fit well together and is tight. The next step is to soak the pieces in apple cider vinegar to remove rust and scale then remove the rest with a wire wheel. After that I blackened the crane with gun bluing solution then clear coated.